For those of you who don’t know me, I’m Paulette’s husband, Kevin. 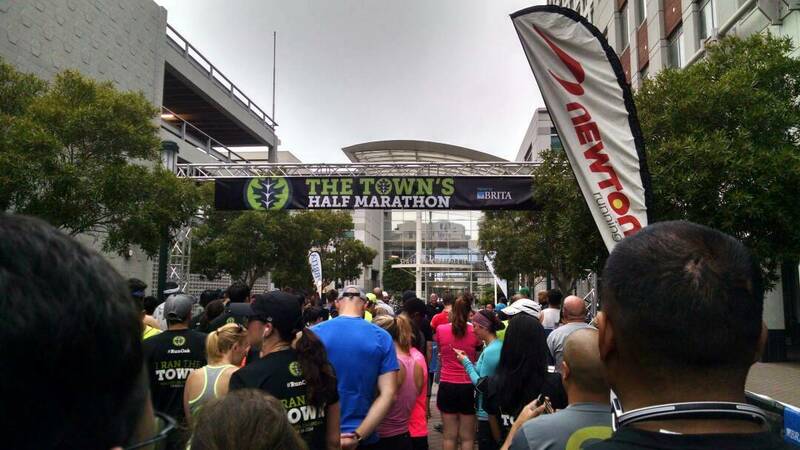 This is my first guest post on the blog and I’m writing it to share my experience last Saturday at a cool new race in Oakland – The Town’s Half Marathon. 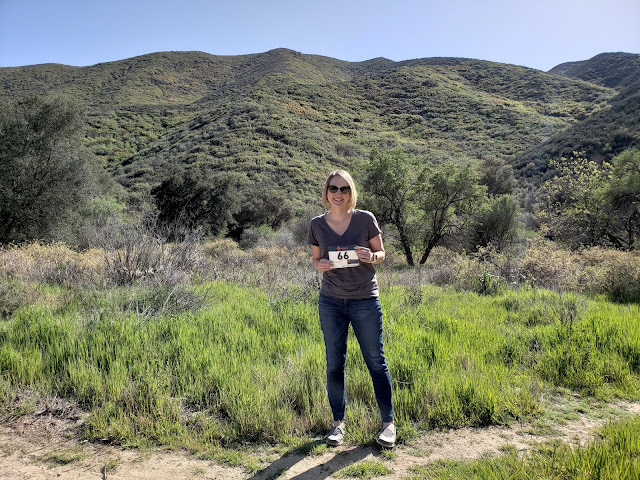 Paulette was offered a free entry to the race, but it conflicted with Bird Camp, so the race director gave her a free entry for a friend or family member instead. I’ve typically had good experiences running in the East Bay and jumped at the chance to run this inaugural event. I like to take transit to Oakland, when feasible, and I was happy to learn that I would be able to take BART to both the race expo and the race itself. On Friday, I caught a VTA express bus near my office in downtown San Jose and took it to the Fremont BART station, where a horde of Raiders fans and I caught a BART train to Oakland. The race expo was outdoors in Palm Plaza at Jack London Square, which is less than a mile from the closest BART station in Lake Merritt. I arrived towards the end of the race expo, so I basically just stopped by to pick up my bib and shirt. The race expo was right next to the iconic Heinold’s First and Last Chance Saloon (est. 1883) and I was tempted to stop in for a beer, but I knew it would take me some time to get home and I wanted to be well rested for the race. On the Saturday of the race, I was able to park for free at the Fremont BART station and take the first BART train at 5:54 AM directly to the start line at Frank H. Ogawa Plaza, which is adjacent to the 12th Street Oakland City Center BART station. Taking transit allowed me to get there about 30 minutes before the race, which was enough time to use the porta-potty and take a few pictures. It was cool and foggy on the day of the race, which was ideal. I was recovering from a cold and decided to run with my hydration pack. It was convenient to have extra fluids with me and taking the pack allowed me to carry additional GU Energy Gels and a Picky Bar. 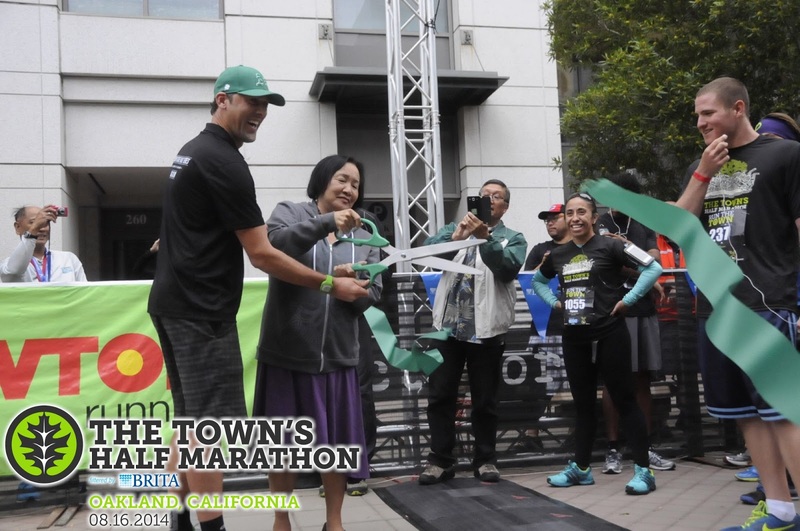 Since this was an inaugural event, Mayor Jean Quan was on hand to say a few words and participate in a ribbon cutting ceremony. This was followed by a jazz keyboard rendition of the National Anthem and the much anticipated start of the race. Several friends have asked about the course, so I’ll take you through it. From the start, the course headed toward the waterfront and made a loop past the Port of Oakland and Jack London Square. From there, runners went back through Downtown and up Broadway towards Piedmont. 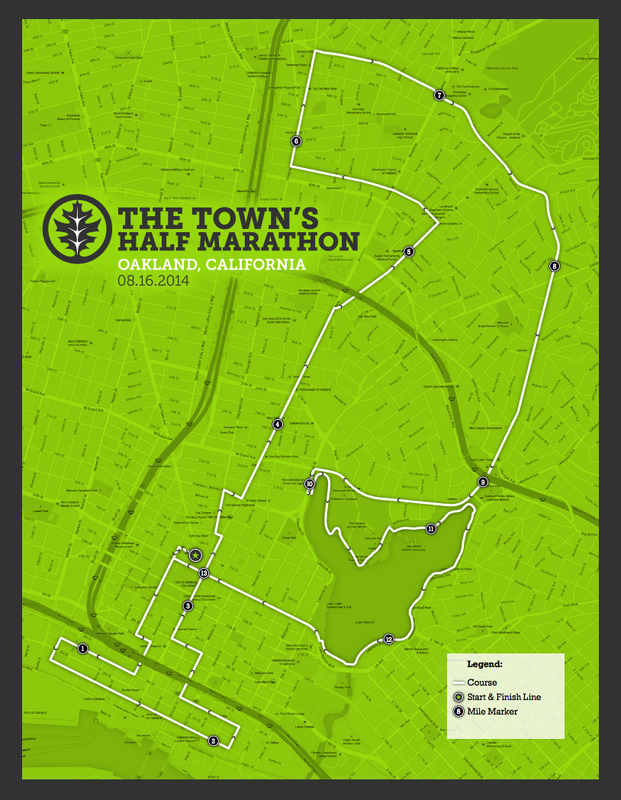 The course then took runners up Piedmont Avenue and around Claremont, before looping back towards Lake Merritt. Runners then made an extended loop around Lake Merritt before returning to Frank H. Ogawa Plaza and the finish line. 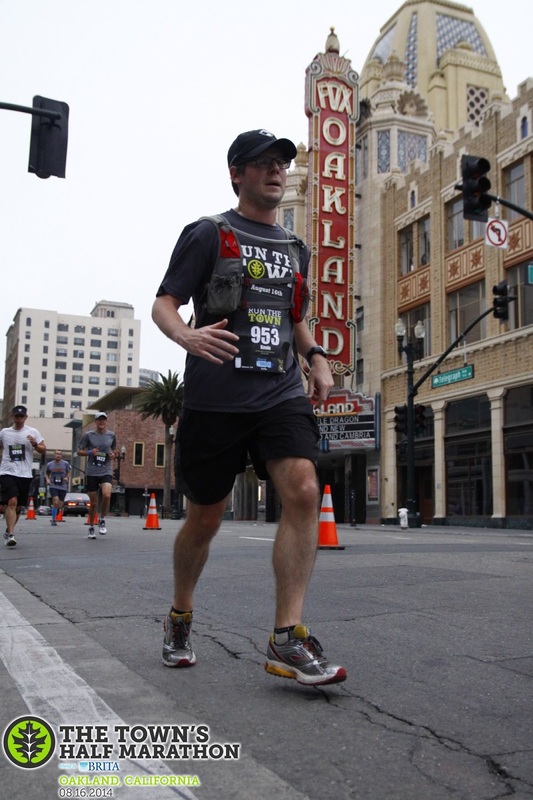 I’ve run a few races in Oakland in the past and this was easily the most scenic. I enjoyed seeing both the Fox Theatre and the Grand Lake Theatre movie palace on the course. 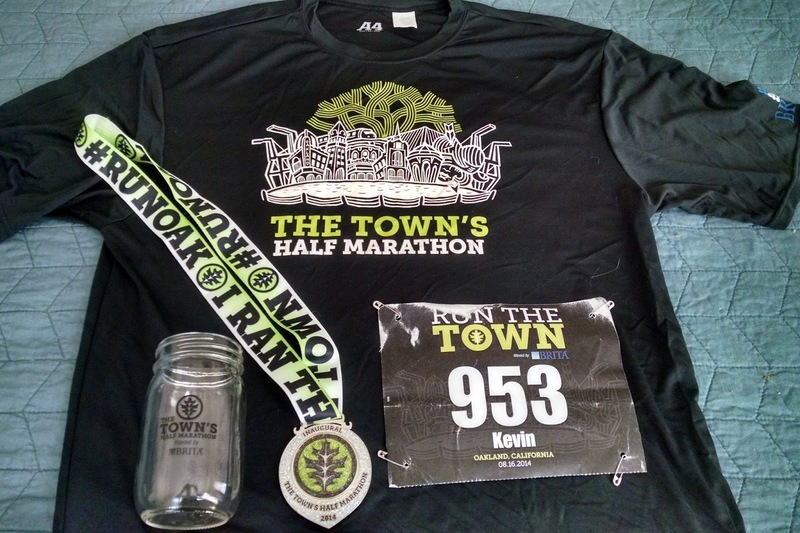 I ran a training pace for most of the race and finished in 1:50:31. The Expo: As I mentioned above, the race expo was the Friday before the race in Palm Plaza at Jack London Square. Volunteers were helpful and I didn’t have to wait in line to get my bib or shirt. There were a small number of vendors selling their wares out of tents on the plaza and, of course, free samples of Nuun. Course Support: There were an adequate number of volunteers on the course and I felt that the Oakland Police Department did a good job directing traffic. I saw a few angry drivers who were upset at being diverted by the race, but generally people were cooperative. There were about six aid stations with water and electrolytes. The Finish Line: The enthusiastic volunteers at the finish line promptly gave me a medal and swag. Instead of bottled water, finishers were given reusable water bottles and directed to a water station where they could fill them. Food at the finish included bananas and “PB & Awesome” sandwiches from the folks at Oakland Juice & Co. The Swag: As advertised, the race shirts were gender-specific technical shirts with a cool design. 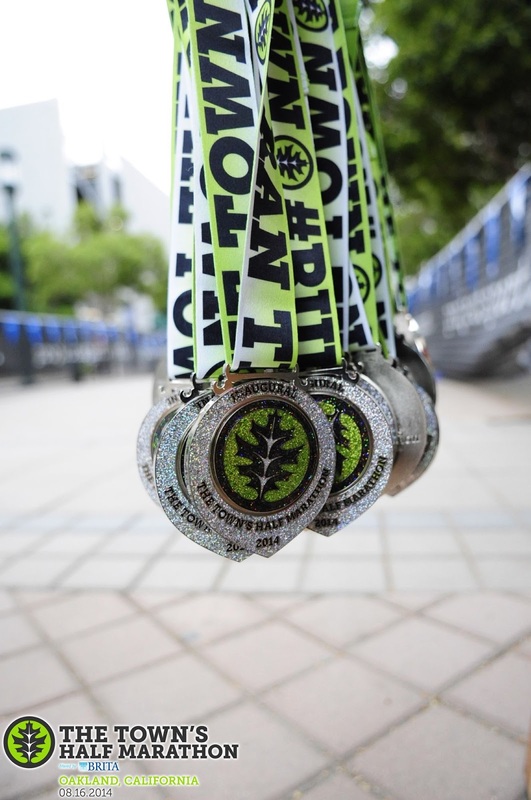 The medals were also well done and incorporated the oak leaf logo from the race. 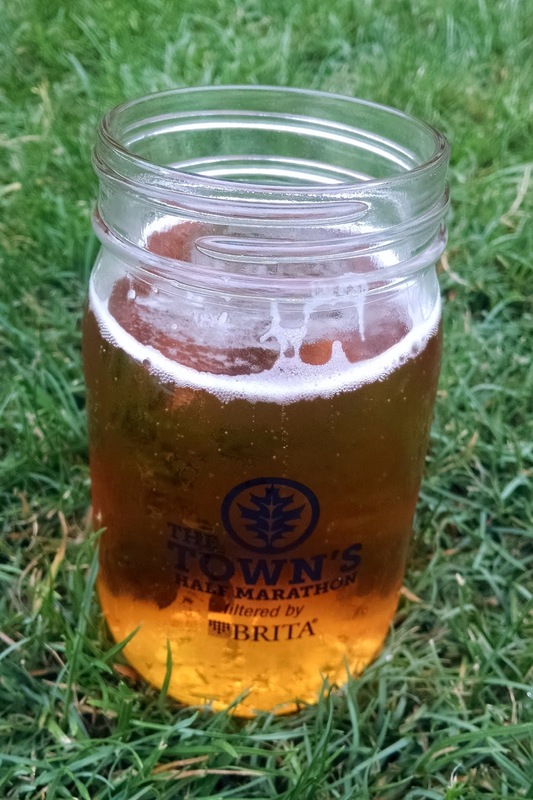 Finishers got a Brita filtering water bottle in the color of your choice and a mason jar for complimentary beer and wine. Strike Brewing had a tent in the beer garden near the finish and I enjoyed a jar of the Blonde, which was perfect for post-race recovery at 4.5% ABV. 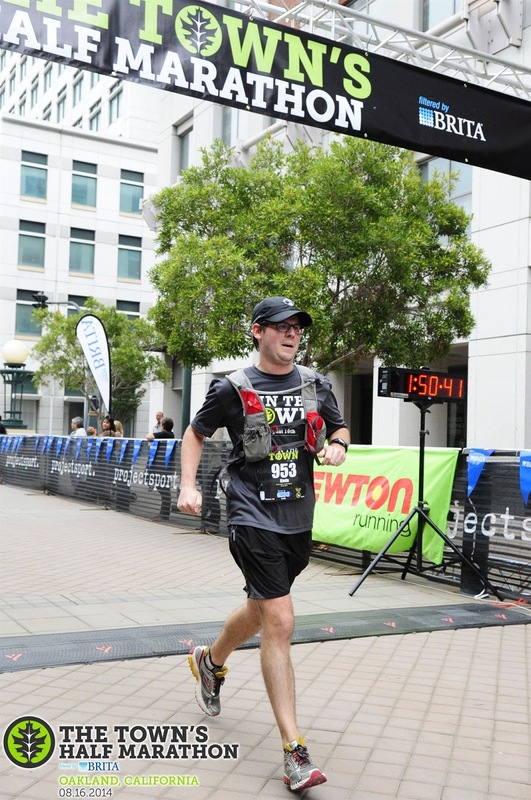 Did I mention that there were free race photos!? Check out the mason jar full of beer! 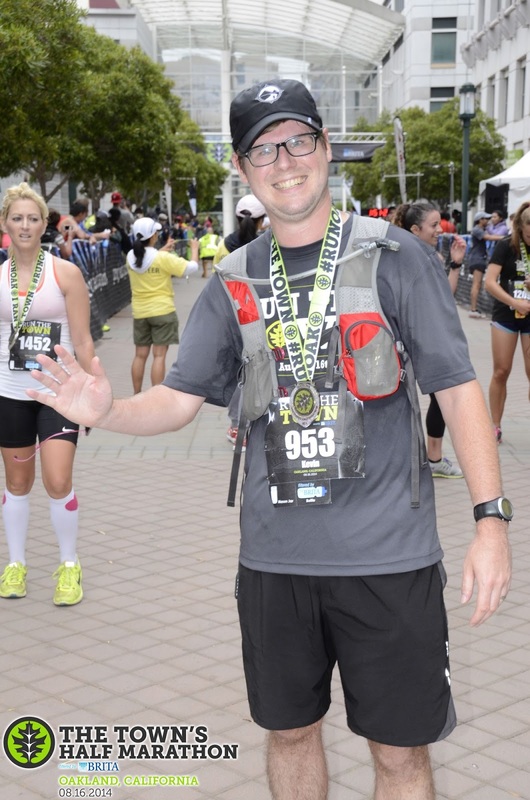 Overall, I had a blast at The Town’s Half Marathon and would recommend it to anyone looking for a late summer half marathon in the San Francisco Bay Area. Awesome! I'm bummed I had to miss this one, but excited to run it next year! Me too! It looked great! I'm by no means a runner, but the course description, scenery, and swag make it tempting for me to start training tomorrow! I know you miss Oakland! Wow! Sounds like a great race :) Thanks for guest posting!! Maybe pencil it in for next year, Meg. Thanks, Kevin! Great race recap!! Hope you and Paulette have a great holiday weekend!